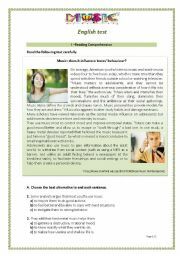 This test is about Music and its influence on teens´ behaviour. It has a multile choice exercise,a matching exercise and questions about the text. 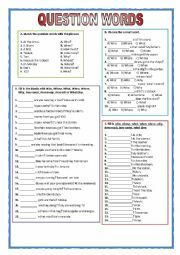 This worksheet focuses on using the WH-Question Words. There are 4 exercises: matching, multiple choice and gap filling. Have a nice day. 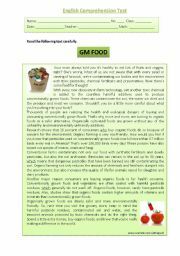 A reading comprehenion test on the topic "Genetically Modified Food" - 4 different exercises, 2 PAGES. Reading tasks: identifying references; finding equivalents; True/false exercise, correcting the false answers; questions on the text. Have a nice day. 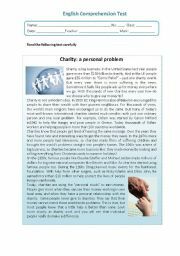 A reading comprehenion /writing test on the topic "CHARITY" - 4 different exercises, 2 PAGES. Reading tasks: finding equivalents; True/false exercise, correcting the false answers; questions on the text. Writing task: commenting a statement or writing a letter to a voluntary organization. Nice weekend! This test is about Tattoos. The reading comprehension part has a finding evidence exercise,finding opposites and questions about the text. The language use part deals with relative pronouns, third conditional and future. Finally, it has a writing exercise with two options. Hope you find it useful. 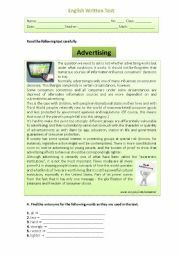 A written test on the topic "Advertising" - 4 different exercises, 2 PAGES. Reading tasks: finding opposites; True/false exercise, correcting the false answers; questions on the text.Finally, students comment on a statement. 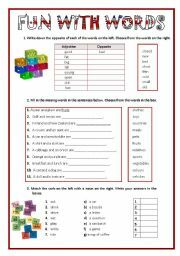 An easy worksheet to let students work with words. A selection of six games with words that can be used in the classroom to warm up, relax, end a lesson or simply have fun! It is a worksheet based on the film “The Pursuit of Happyness” which is a beautiful film to emphasize the importance of working hard to get what we want. It has three different activities. Hope you find it useful. 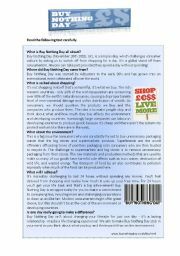 Reading comprehension about "BUY NOTHING DAY" (celebrated on 26th November)+ speaking activity. This presentation is designed to teach RELATIVE PRONOUNS.It provides students with a clear explanation, along with examples and exercises. This presentation is designed to teach Quantifiers (some, any, no).It provides students with a clear explanation, along with examples and exercises. This presentation is designed to contrast the PRESENT SIMPLE and the PRESENT CONTINUOUS.It provides students with a clear explanation, along with examples and exercises. Have a nice day! This presentation is designed to teach the present simple.It provides students with a clear explanation, along with examples and exercises. 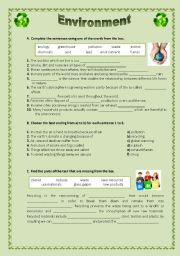 This presentation is designed to teach the PRESENT PERFECT - form and uses, examples and exercises to practice.Have a nice day.